Product prices and availability are accurate as of 2019-03-31 03:40:11 UTC and are subject to change. Any price and availability information displayed on http://www.amazon.com/ at the time of purchase will apply to the purchase of this product. 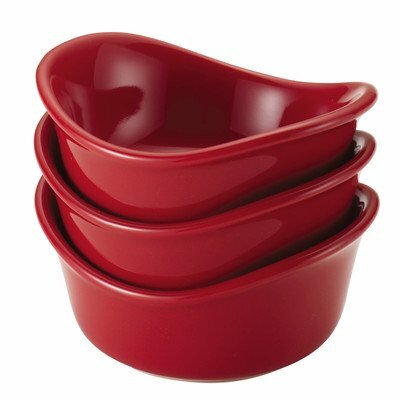 58753 Color: Red Features: -Set includes dipping cups with a vibrant contemporary design and stylish flared sides. -Oven safe to 500°F. -Microwave, dishwasher and freezer safe. -Manufacturer provides quality assurance guarantee. -Durable stoneware construction. Product Type: -Condiment server. Material: -Stoneware. Pattern: -Solid color. Dimensions: Overall Height - Top to Bottom: -5.75". Overall Width - Side to Side: -4.75". Overall Depth - Front to Back: -6". Overall Product Weight: -1.3 lbs.